Managing your business’s Facebook page should come with an instruction manual – except it doesn’t. 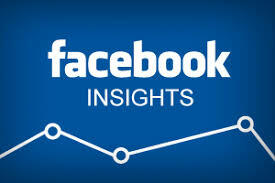 The Facebook Insights page takes some getting used to, especially if you’re new to your business page. To start, here are a few terms you’ll want to know. You’ll see these commonly across all social media platforms (Twitter and Instagram mostly), but we’ll focus on Facebook here. Boosted Posts: Posts that you paid to send to more followers. Facebook only shows your post to a fraction of your followers, so a paid boost will get it in front of more users. Engagement: Anytime someone interacts with your post. Includes comments, likes, and shares. Followers: Number of people who like AND follow your page. This should be about the same as your Page Likes number. It would be lower if users are liking your page, then deciding they want to “Unfollow” and stop seeing your content in their feed, but keep liking your page. Impressions: The number of times your content was displayed, no matter if it was clicked or not. Page Likes: Number of people who have clicked “Like” on your page. Post Clicks: Any clicks done on the post. Could be to expand the post to see the caption, to view a link, to see your page, or to pause/play a video. This includes all likes and reactions. Promotions: All paid ads or paid boosted posts. Reach: The total number of (unique) people who saw your content. Now that you understand the vocabulary, let’s look around. From your Facebook page, click “Insights” at the top. Post reach, meaning how many people saw your content. This includes organic (non-paid) and paid reach. Engagement, including all interactions with the post. Includes Post Clicks and a combined count of reactions/comments/shares. Promote status. You can see the results from the promoted post if it was boosted, or you can choose to promote the post to a further audience at any time. Go to “See All Posts” if you want to analyze more than the last five posts. This tool is extremely important for creating content and working on your social media strategy. By seeing all your posts compared to each other, you can get a sense of what your followers like most. Did a video get more engagement than a link? Did a meme do better than an infographic? 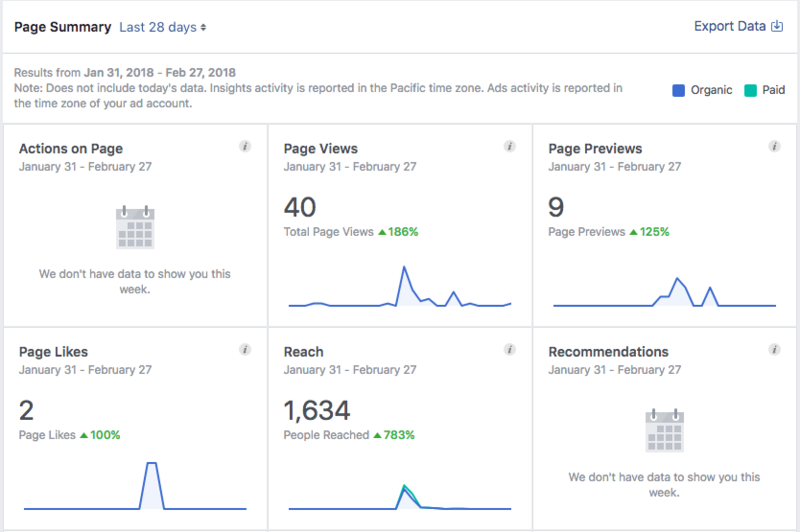 Below the post stats are “Pages to Watch.” If you have competitors on Facebook you want to track against your own social media progress, add them to see how you compare in Total Page Likes, percent of change from the previous week, number of posts that week, and amount of engagement. Adding pages with a similar amount of followers might be the most helpful. Reach – The number of people who had any posts from your page enter their screen over time. Also includes number of reactions/comments/shares, and stats on users hiding or reporting your content. Page Views – Total number of people who viewed your Facebook page over time. Includes where they were referred, which parts of your page they visited, and the demographics of those visitors. Page Previews – Number of people who have “previewed” your page, meaning hovering over the page name to see a sample of content. Actions on Page – Number of people who have clicked your phone number or address, or clicked your Action button if you have one. Posts: Glance at when your fans are online, plus your most popular post types. You can also see the most popular post types for whichever competitor pages you’ve chosen to follow. Also shows stats of all posts published. Events: Information for any events your page has published. Videos: Stats on any videos you published. Includes an in-depth look at viewership to overall performance. People: Find demographics on your fans, followers, and all people reached/engaged here, including age, location, and language. Messages: Stats on any conversations you’ve had in the Messages service. Getting used to Facebook Insights is a big task, but a necessary one if you want to grow your following and find more customers. Which element of these stats are most interesting to you? Are You Using Gated Content on Your Site? How can I improve the SEO ranking for my website? How can I perform an SEO analysis? Can social media help to increase my SEO ranking?